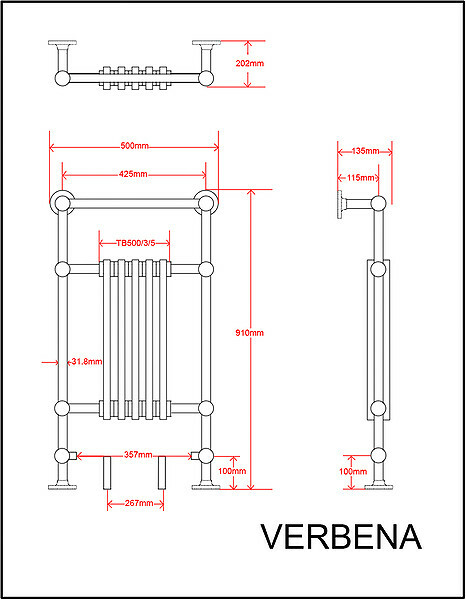 Verbena Traditional Towel Rail: 500mm x 910mm available in Chrome, standard Water. The Verbena is compact in size with minimal projection making it 'perfect for en-suites.' However the space saving design doesn't compromise on heat output or towel drying space. A wide range of colours and finishes give you the flexibility to compliment your bathroom interior perfectly. valves in the picture are not included in the price but can be purchased separately. All of our Towel Rails are hand made with High Grade Materials and brazied with 45% Silver which gives you the assurance and guarantee for peace of mind. 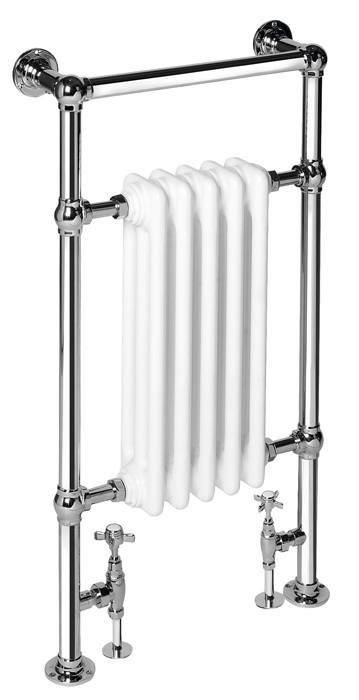 Need Help With Choosing The Right Towel Rail? Our friendly and professional staff at Just Towel Rails have years of experience in the radiators industry and are available on the phone to answer any questions on our towel rails you may have, please call Just Towel Rails on 01889 585 366 and we would be glad to help with any supply or installation questions or just guide you to the best towel rail solution for your budget. Why Choose Just Towel Rails? At Just Towel Rails we pride ourselves on having great customer service with any customer issues always dealt with as a priority, we make sure all of our products are of the highest quality and avoid cheaper inferior products that don't stand the test of time. At Just Towel Rails all our items Free UK Delivery is offered so the price you see on the product is the price you pay so there will be no hidden charges when you get to our checkout process. Don't forget if you have any towel rail questions at all please call us now and we would be glad to offer our friendly and expert advice. Centre to Centre: 425mm / 16.73"
Tapping Centres: 357mm / 14.06"
Valve Pipe Centres: 267mm / 10.51"
Wall to Centre Tapping: 115mm / 4.53"
Floor to Centre Tapping: 100mm / 3.94"
Overall Projection: 135mm / 5.31"
Tube Size: 31mm / 1.22"